Juvva is one film which has caught the attention of many, right from the day it was launched. 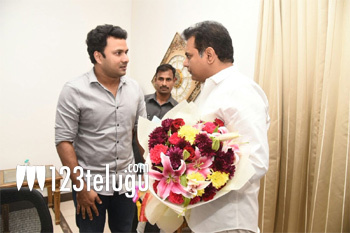 The latest we hear is that the audio of the film will be launched by TRS head honcho, KTR on the 11th of this month. Directed by Trikoti, this film has Ranjith and Palak Lalwani as the main leads. MM Keeravani is the film’s music composer. The teaser which was launched by Chiranjeevi has won decent appreciation all over. The romantic comedy is produced by Dr Bharath Somi. The release date will be announced soon.